The world we live in! : Yeh Dil Kyun Dhadakne Do! Yeh Dil Kyun Dhadakne Do! 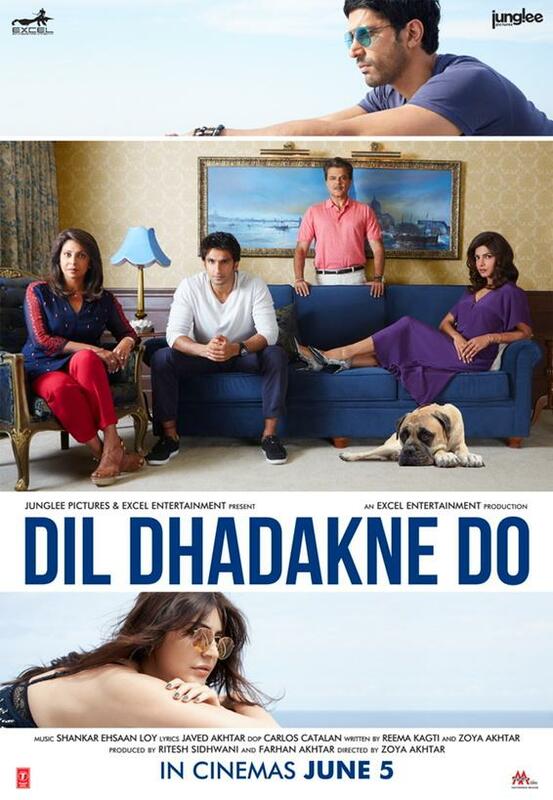 Too many critical views on Zoya Akhtar’s latest Bollywood venture Dil Dhadakne Do. I found most of these views outright dismissive, which obviously proved wrong, in due course. Reviews with comments like, characters won't stay with you, the movie is too long, there is nothing to take away from this movie were floating in the papers and online. But going with Zoya's reputation, I would not miss the movie for a few reviews, by some overtly critical people. The reviews can take a walk as the movie has touched a chord with many a urban viewers and has even raked many intricate issues which usually are brushed under the carpet in Indian families. The movie also does leave you with a lot of thought. Of Course if you were looking for enlightenment then you would rather take a yoga retreat in Rishikesh than look for it in a commercial Hindi movie. 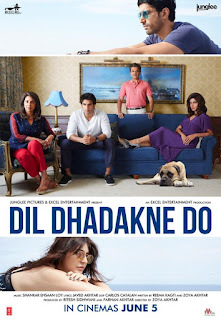 I for one really liked the movie, and my “Aha” moments of the movie were many, and I would definitely like to point out a few of those scenes to the readers so that Zoya Akhtar's efforts are not buried under a heap of “Boos”. a) Unconditional love between siblings. This was special; for me Kabir taking sister Ayesha’s side, come what may. how sweet that he actually feels the hurt of a daughter for being treated as second citizen in her own home was very refreshing to see. Kabir's stand for his sister is something, which really steals your heart. There’s something about a brother’s love, which makes most men insecure, and this is captured in a beautiful way. Watch out for Ranvir’s “aunty wo butter knife hai” scene with Zarina Wahab. It shows the naughtiness only a brother can get away with. b) Papa is always there. Loved it when Kamal Mehra takes his son in law Manav by the collar. Manav incidentally exhibits his chauvinism to his wife in front of the whole family. Thats when Kamal decides enough is enough and stands up for his daughter. This scene moved me to tears, as finally the patriarchal mindset of Kamal understands a daughter’s anguish and protects her. This scene is a statement because though we speak of fathers having a soft corner for daughters, our society still refuses to speak up when she goes through turmoil by the hands of in laws or husband. DDD is not a women’s empowerment movement. But there are scenes which are speaking of a new wave. When Farhan’s character, Sunny points out to Manav played by Rahul Bose using the expression “I allow my wife to work” as derogatory and not justifying his “equality” qualm. It’s quite a scene. Hats off to Zoya, its not overtly loud and preachy, but subtle and straight and hits the bull in the eye. Also DDD captures the subtle things which people miss, women who have made it to the Forbes list on their own, daughters who are not given their credit, fathers who see the son as everything, mothers who advise their daughters to shut up in an unhappy marriage, there is also a display of steering of the stereotypical image of Muslim girls. Farah played by Anushka shares her story of running away from home for the love of dance and art. Anil Kapoor as Kamal Mehera will amuse you, and disgust you at the same time. In Piku we saw parents can nag, here we will see a much more hidden side shown brilliantly, that they can brag. “I am a self made man”, now, how many times have you heard that! Kamal Mehera and his wife are bitter about each other, but at the same time they will shock you with their unity in scheming to keep family money intact. So is the business world cunning? One wonders. What did your parents bribe you with? A toy car? An ice cream, a Cadbury? A Barbie? I burst out into laughter when Anil Kapoor in a straight face asks, “Plane chahiye ke nai tumhe?” as bribe. Epic! e) Choose love, swim or drown. Love doesnt have to be only between two people, it could be your love for music or dance or science too. Anushka or Farah is a Muslim girl who runs away from home to follow her love or passion for dance. She tells Kabir or Ranvir, when the time comes there are choices, either swim or drown. And also Love happens, believe. I loved the instant karmic connection shown between Ranveer and Anushka. Guys, have we forgotten, this is how it, this is pure romance. But the director also doesn't wish away lust, yes that matters too. You need to lust after your object of love. Loved the openness with which the Farah and Kabir share about each other and show that they have a connection. No cat and mice games here. f) Stand up for Yourself, no one else can. Ayesha, Priyanka Chopra is stuck in an unhappy loveless marriage, she has unappreciative parents and inlaws. Still she starts her own company and takes it to great heights. She respects her husband and his family enough to keep quiet when she is silenced at every sentence at the dinner table. But she respects herself also enough to walk away when she can’t pretend anymore. What I saw is love is the greatest bond, if there is no love in a relationship, one can choose to make oneself happy. Loved the scene where she tells her husband, “I want a divorce”. Standing for oneself and not staying unhappy, go girl! g) Character artistes get a second chance. Parmeet Sethi, where were you, welcome back. Yes, there is a lot of opulence and riches which most of us do not relate to and yes, many of us feel a pang of ‘ J’ (jealousy) in our tummies, but please loosen up and look at the brighter side. You get to set your itinerary for the next trip. You can either be inspired or choose to wallow in your jealousy. Choose. Though less beautiful than the Titanic, this cruise enticed me a bit though. The scene where Ayesha stands on the deck looking at the sea reminded me of Rose in Titanic. And Jack aka Sunny here, says, “I read your mind, you were planning to jump isn’t it”. e) Respect animals, never say shoo! Amir Khans voice and the cute Pluto and his philosophical commentary, stole my heart. If my guess is right, Javed Akhtar has worked his magic of words in form of Pluto Mehera’s mind speak, or rather heart speak. Did I just read, this cruise isn’t docking anywhere type of review somewhere. Don’t go for it, try DDD, probably your heart will learn to say Dhak Dhak once again. Once again I would say Zoya Akhtar has captured some easy to miss emotions very typical to our society.